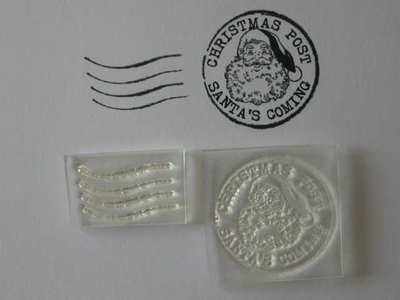 A cheery postmark stamp to decorate your Christmas card envelopes, lovely for children. Or can be used with other stamps to make background paper. The text 'Christmas Post' and 'Santa's Coming' is around the outside with Santa's face in the centre. 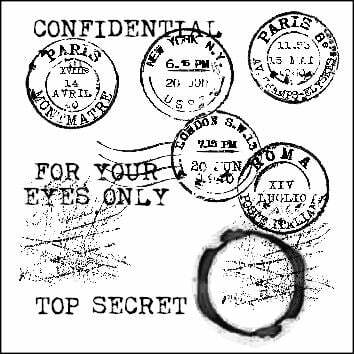 The stamp has a grungy circle with vintage style text. The circle is 2.5cm. The separate wavy line stamp (2.5 x 1.4cm), which can be stamped either side of your postmarks, is included. Use with acrylic block, either the 5x5cm block and stamp the circle and the lines separately, or the 5x8cm block and stamp them at the same time.